At Sand Mountain Toyota, our team is dedicated to exceeding your expectations each time you visit! Conveniently located in Albertville, AL, we are proud to continuously provide our community and surrounding area with outstanding professional service. We offer an impressive selection of new and used vehicles, and our goal is to provide you with our best sales and service experience as we can. Our diverse family of employees continually demonstrates an unrivaled level of integrity and respect for our clients and our philosophy has always been to foster long-term relationships with our customers. 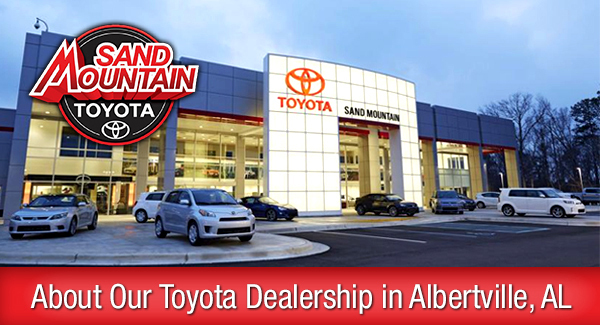 If you are looking to get behind the wheel of one of our newest models or searching for an old favorite, Sand Mountain Toyota will provide you with our best customer service. We will proudly assist you through the whole process to make your car buying experience as effortless as possible whether you're looking to purchase a new or used vehicle or service your current one. Our experienced sales staff is eager to share its knowledge and enthusiasm with you. Feel free to stop by our dealership today at 9167 US Highway 431 in Albertville, AL. We look forward to serving our customers from Hunterville and Guntersville.